Here is some new wiring diagram, based on well known Gretsch guitar circuit. I didn't add anything new into it. 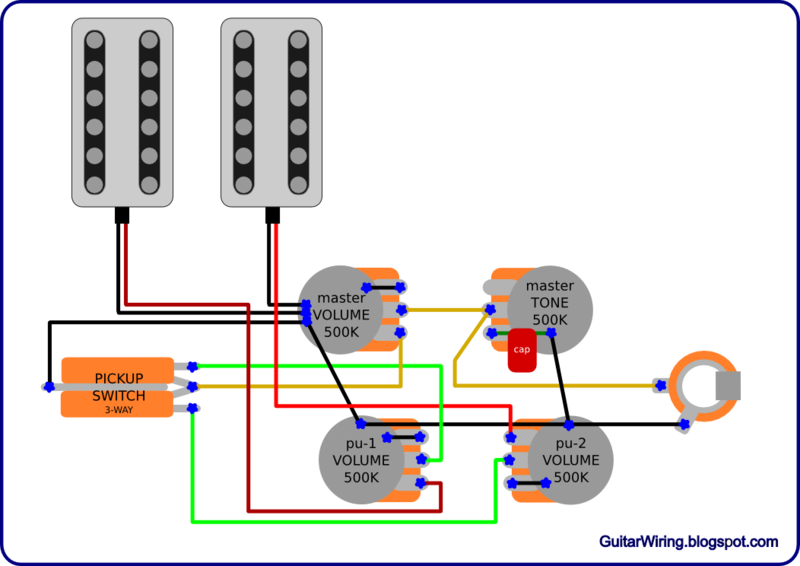 I just adapted the Gretsch's wiring to make it easier for those of you, who would like to mount it in some Les Paul, SG, or Telecaster Deluxe body. This kind of circuit is used in guitars like White Falcon, Country Club or Nashville. For better order, I used few colors for hot wires: maroon, red, green and yellow. As you can see, there are four pots: master volume, master tone, pickup-1 volume and pickup-2 volume. The master volume is placed closest to the players hand. You can make it with easy-to-get parts, like common 500K pots and 3-way, Gibson-style toggle pickup switch. I didn't write the tone cap value, because it depends on your pickups. I recommend to use not too hot pickup models, because this wiring will give a quite significant impact from pots (load). Very hot pickups with this circuit can make a really dark tone. The volume control got some treble bleeding. It's basically an advantage in this example. We have three pots for this function here, so it gives many tones to reach, just by slight turns of knobs. Volume potentiometers adjustment will also affect work of the tone control. There is a lot to do in the middle pickup switch position. We can regulate the balance between both pickups, by their own volume pots, and the overall output by master pots - volume and tone. The wiring will make the tone darker, than a common Gibson-style circuit. It can be very good for some bright „sounding” pickups.